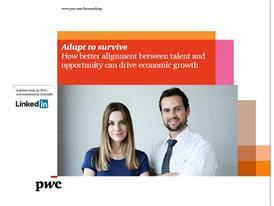 New research by professional services network PwC, commissioned by LinkedIn, the world's largest online professional network, today reveals that poor talent adaptability – the inability for people to retrain for new skills or switch industries – is costing the global economy billions of dollars in lost productivity and leads to businesses wasting huge sums on avoidable recruitment costs. 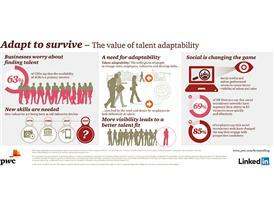 The study, Adapt to Survive, for the first time analyses millions of interactions from LinkedIn's network of 277 million professionals, and information on 2,600 employers from PwC's Saratoga database, one of the world's largest and most robust resources of people and performance metrics, to understand which countries are better at aligning talent with opportunity. •	A lost opportunity to generate US$130bn of additional productivity1 – the research found a strong correlation between the adaptability of the talent in a particular country and the performance of its companies. If markets were better at matching talent with the right opportunities, this could unlock as much as USD$130 billion of productivity in the 11 markets studied (including USD$65.6 billion in China, USD$29.3 billion in the US and USD$11.7 billion in Brazil). •	Avoidable recruitment costs of US$19.8bn2 – this lack of access to the right talent is driving up the cost of recruitment for employers today. The longer time taken to find the right candidates, and the increased likelihood for mismatched talent to leave sooner are costing companies in those countries US$19.8bn in avoidable recruitment costs. 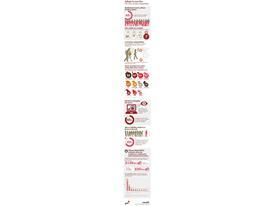 The research spans a wide spectrum of economies by development phase, size and industry types. Each market is assigned a Talent Adaptability Score based on five key behavioral factors, which include: the average number of times professionals in that market switch industries, the average number of different positions held in a professional's career, the average number of internal promotions in that market, the average number of employers a professional has had in each market and the average number of open vacancies divided by the market's population. 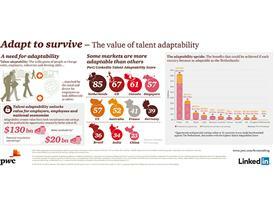 The Talent Adaptability Score is a powerful indicator of a market's ability to respond to future shifts in demand, not a snapshot of current economic performance. Scores vary significantly by country (see table), with the Netherlands' multilingual workforce and international business base placing it first in the ranking. Emerging markets India and China have lower scores due to the existence of fewer mature sectors and their geographic size which limits talent mobility. Well-performing economies such as Germany rank lower than expected, in part because it is a specialised economy which works well whilst its sectors are buoyant and stable, as they are today. But it also makes the country less able to respond to structural changes. 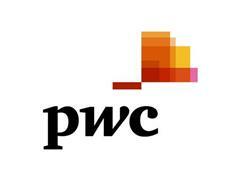 Commenting on the findings, Michael Rendell, Partner, Global Head of HR Services practice at PwC, said: "Worldwide unemployment continues to rise while jobs remain unfilled, and CEOs are worried about a growing skills gap. The better employers and employees are at adapting to changing circumstances and aligning their skills with the available opportunities, the more productive organisations will become. Our research shows that a better talent fit between employer and employee could unlock $130bn in additional productivity globally, begin to close the skills gap and drive a market's competitive advantage." David Cohen, LinkedIn Senior Director of Sales, EMEA, added: "Countries increasingly differentiate themselves in the global marketplace via their human capital. Up until now, it's been challenging for them to assess the skills, knowledge and experience of their workforces due to the dearth of professional data. We're hopeful that countries will leverage the insights uncovered in Adapt to Survive to maximise the efficacy of their human capital and create more opportunities for their workforces."